Sixty years is a long time. 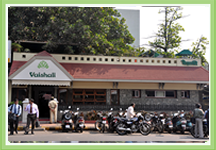 Vaishali Restaurant is a landmark in Pune. It has always been one of the city’s most respected and well-loved places. Established by Shri Jaggnath Shetty, it has become synonymous with quality. Over the years, it has constantly grown – in both space and the range of service. Every facility has added to the grandeur of the restaurant. Right from the garden restaurant to the cozy rooftop corner – it has added value.